Google was caught red-handed participating in NSA’s surveillance, which is both illegal under the U.S. constitutional framework(*), and conducive to a totalitarian world where self-censorship under one all-seeing eye prevents alternative futures from flourishing from collaborative creative efforts of individuals. Google’s business model of collecting all data and profiling everyone has set the trend towards generalized practices of mass-surveillance, normalized such practices, and punished those who try to evade constant surveillance (by sinking their time in training Google's AI on Google Scholar, for example). Our behaviors, our intimate connections, actions and emotions Google is commodifying and profiting from. We are reduced to a resource and stunted in development as persons and communities capable of meaningful choice, in exchange for colorful convenient toys. (*) Constitutions of democracies worldwide are affected by this general attack on secrecy of correspondence and freedom of assembly in the digital age. In theory, your local government is in charge of protecting your population from outside forces threatening your constitutional democratic order, but our system of jurisprudence is such that you can only punish a government for doing something unlawful, you cannot easily punish it for not doing anything. So it depends on us to take to the streets, make a campaign, start a movement that demands the introduction of laws that technically impede surveillance -- for example by making end-to-end encryption and metadata protection *mandatory* for all digital communications, thus forbidding Google & friends from having access to them. PRISM integrates corporate cloud systems into XKEYSCORE, the NSA search engine encompassing all private data of digital humanity, including access to the Google, Facebook, Microsoft, Apple, Skype, Yahoo, Youtube and other PRISM partners. According to leaked slides it has access to e-mail, chat, photos, videos, stored data, file transfers, login activity, social networking ("personal details", "pattern of life", "connections to associates"), telephony (both on and off the Internet) and video conferencing. Passwords are used as a way to identify multiple accounts of the same person, as people frequently use the same password across platforms even when varying usernames. "how the United States intelligence community funded, nurtured and incubated Google as part of a drive to dominate the world through control of information. Seed-funded by the NSA and CIA, Google was merely the first among a plethora of private sector start-ups co-opted by US intelligence to retain ‘information superiority.’"
Up into the 80's, all of the technological world attempted its own designs of computers and operating systems, but during the 90's the USA has established a worldwide dominance in operating systems from Microsoft Windows and MacOS to today's Apple iOS and Google Android. While predicating the principles of free market and deregulation to the rest of the world, the US was silently adamant in actually subsidizing technological start-ups well enough to kick other nations out of business. Oracle, the market leader in database technology that produced one of the richest people on the planet, was named after a CIA program. The NSA has been collecting more or less all e-mails, phone calls and SMS text messages since the creation of the Internet. In 1995, as the Internet started becoming popular, the US government made a strategic decision to keep total control of digital networking. "The US was the major player in shaping today's Internet. This resulted in pervasive exportation of American culture as well as technology. It also resulted in a lot of money being made by US entities." It is then that the CIA financed the research of some Stanford students regarding the PageRank algorithm, essentially funding the creation of Google. With such powerful ability to find needles in the haystack of the web, the secret services also wanted such a tool for all of the e-mails and text messages. Journalist Nafeez Ahmed has researched, how Google empowered the NSA to become the gigantic beast it is today. It is no surprise that Silicon Valley companies have a long tradition of friendly collaboration with the secret services that are among their best customers. 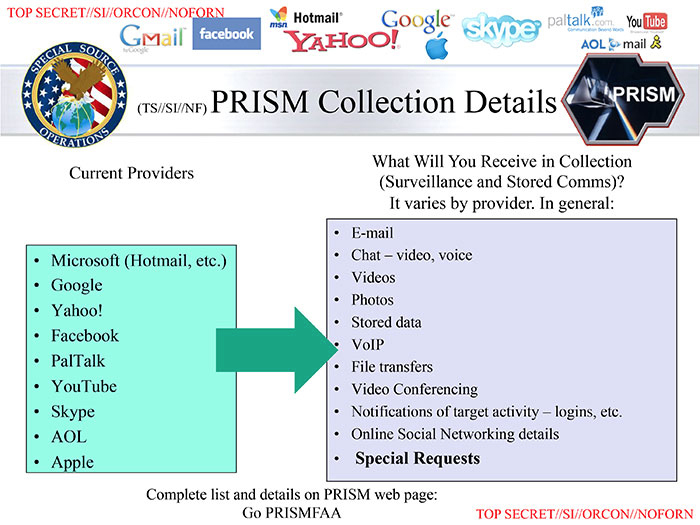 The impressive effectiveness of the PRISM program is a result of that, but there are earlier cases like IBM allowing the NSA to have a backdoor in Lotus Notes in 1999 or Microsoft being caught with the mysterious _NSAKEY. In rare cases, when technologies arise out of the control of the US government, an American company quickly acquires such technology. Skype originally provided video telephony that the secret services were unable to decrypt. So, eBay bought Skype from the Estonians even though it never really had a business model for it. This way Skype became an American company, and got integrated into NSA's PRISM surveillance program. Since the beginning of 2017, Android phones have been collecting the addresses of nearby cellular towers—even when location services are disabled—and sending that data back to Google. The result is that Google, the unit of Alphabet behind Android, has access to data about individuals’ locations and their movements that go far beyond a reasonable consumer expectation of privacy. Surveillance capitalism is a term used and popularized by academic Shoshana Zuboff that denotes a new genus of capitalism that monetizes data acquired through surveillance. According to Zuboff, surveillance capitalism emerged due to the "coupling of the vast powers of the digital with the radical indifference and intrinsic narcissism of the financial capitalism and its neoliberal vision that have dominated commerce for at least three decades, especially in the Anglo economies" and depends on the global architecture of computer mediation which produces a distributed and largely uncontested new expression of power she calls 'Big Other'. She states it was first discovered and consolidated at Google, being to surveillance capitalism what Ford and General Motors were to mass-production and managerial capitalism a century ago, and later adopted by Facebook and others and that it uses illegible mechanisms of extraction, commodification, and control of behavior to produce new markets of behavioral prediction and modification. Check out the full paper titled 'Big Other: Surveillance Capitalism and the Prospects of an Information Civilization'.